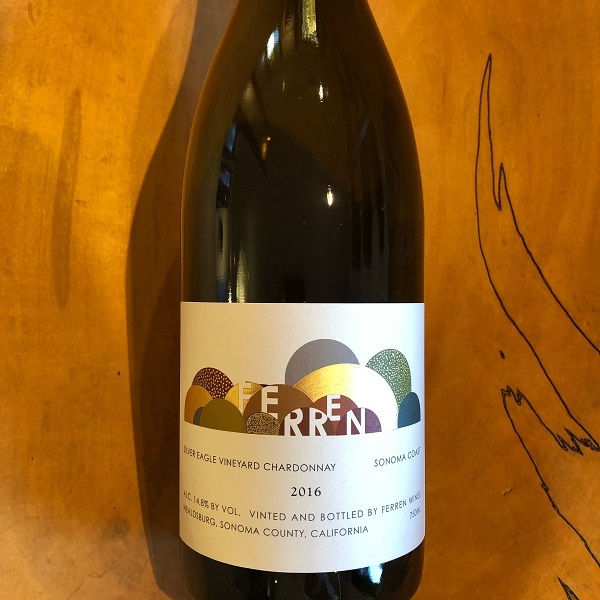 This 2016 Chardonnay is Matt Courtney's fourth vintage of Ferren and comes from Silver Eagle Vineyard, where Occidental moves into Russian River Valley. It is the second ridgeline in from the Pacific Coast and gets the best of both worlds- the cooling breezes from the Pacific Ocean and the warmth being protected. Mark Aubert and Matt split this vineyard with Matt getting Old Wente clone Chardonnay. “The wine made from this unique confluence of climates is extraordinary: The Pinot noir a rare balance of explosive wild berry, mouth-watering acidity, and rich, polished tannins; the Chardonnay a fascinating juxtaposition of briny minerality and candied citrus.” 110 cases were produced.